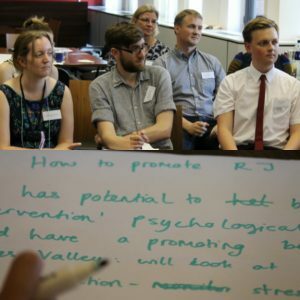 The Observer Programme has been running since 2013 and is a partnership with Restorative Justice Council and supported by the Ministry of Justice. 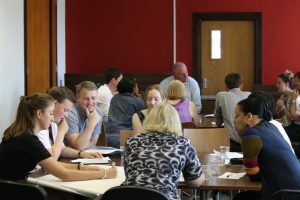 The Programme is designed to take influential decision-makers into a RJ meeting between victim and offender; offering the observer a unique opportunity to understand the RJ process whilst demonstrating the benefits for the victims. Since its inception the Programme has taken 44 MPs, PCCs, Judges, Magistrates in to observe. The event began with a presentation from our Observer Programme Coordinator, Alicia Edmund, sharing the successes and highlighting some of the challenges RJ services may come across in developing a local Programme. She shared an audio interview with Why me? trustee and previous observer, Richard Monkhouse who shared his reflections and comments on how other RJ Observation Programmes can “make it [RJ] real to people higher up the food chain”. Richard spoke of his “bingo moment” that occurred during a Neighbourhood Justice Panel and how for him it demonstrated how valuable the RJ process is. Following this, John Willetts from Sussex PCC gave an insightful pr esentation on Sussex’s Observer Programme. 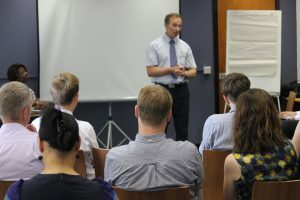 He mentioned how it had become a great tool to showcase the RJ work within the partnerships and across the county, along with few challenges they still have to navigate – namely managing the expectations of senior management and facilitators; all useful information for services thinking of developing its own Observer Programme. The afternoon workshops highlighted the wealth of knowledge in the room. A key discussion point was around the importance of shared vocabulary between agencies when introducing RJ process to the general public, victims of crime or potential decision stakeholders. This point is echoed in the Restorative Justice Council recent poll which revealed that 80% of the public believe victims of crime should have the right to meet their offender but only 28% know what Restorative Justice is. The political and social landscape has evolved since the Why me? 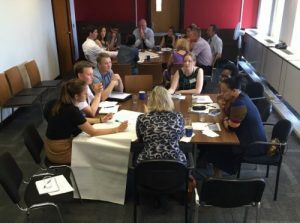 Observer Programme launched in 2013 and so the workshop proved a timely opportunity for practitioners to share experience and ideas on how best to engage today’s local and national decision makers. Why me? 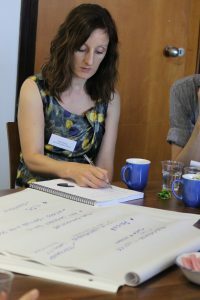 plan to produce a toolkit that will support RJ Managers and Services in delivering a local Observer Programme. To find out more about the Why me? Observer Programme and/or offer comments on the toolkit, please contact Alicia Edmund on 0203 096 7708. Many thanks to everyone who attended and contributed to the day we look forward to meeting again soon.